High Elms Country Park near Downe is a procession of pushchairs, straining dogs and track-suited walkers meandering and marching under tall pines and Wellingtonias (Sequoiadendron giganteum). At the top of the hill, protected by grandstands of tall ash (Fraxinus excelsior) and sycamore (Acer pseudoplatanus), are the Sunday golfers. The hedgerow birds hide from men hunting their lost handicaps in the thick holly (Ilex aquifolium) and bramble (Rubus fruticosus). 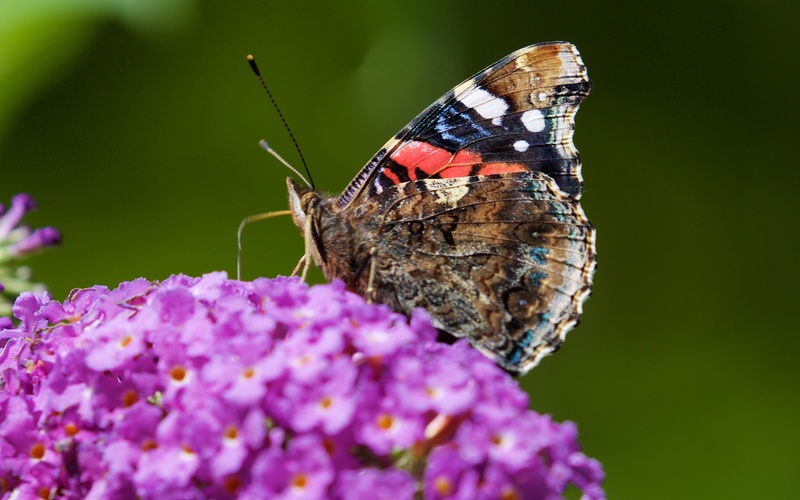 Under the hot morning sun, butterflies are much more overt and mine the nectar greedily on the pink and purple Buddleja spikes, working the florets up and down and in so doing winding round each flower in a slow staccato roll. 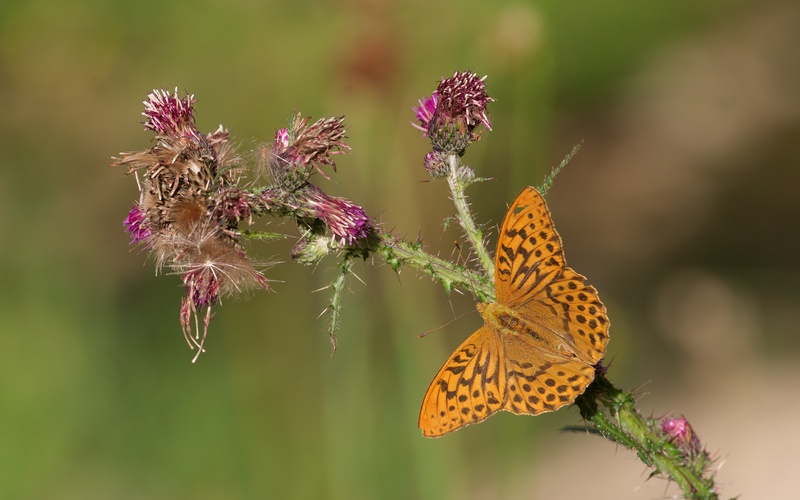 A single silver-washed fritillary (Argynnis paphia) is the star but is chased away by a persistently aggressive gatekeeper (Pyronia tithonus); there are also peacocks (Aglais io), red admirals (Vanessa atalanta) and a large white (Pieris brassicae). The underside of a red admiral is the most striking abstract art with electric lines of powder blue against blacks, reds, and whites on the upper wing and mottled, camouflage browns and battleship greys below. Silver-washed fritillary on marsh thistle (this one in afternoon light at Broadwater Warren near Tunbridge Wells). 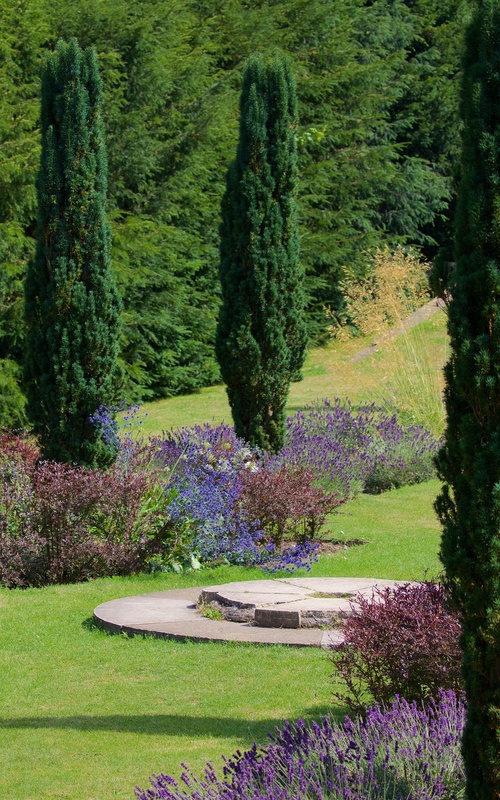 The Italian garden is a quiet backwater; the symmetry of tall yew (Taxus baccata) hedge, small Mediterranean cypress trees (Cupressus sempervirens) and brilliant blue borders around a stone centre-piece, perhaps a statue that has long ago walked off its stage, creates a cool and peaceful space. 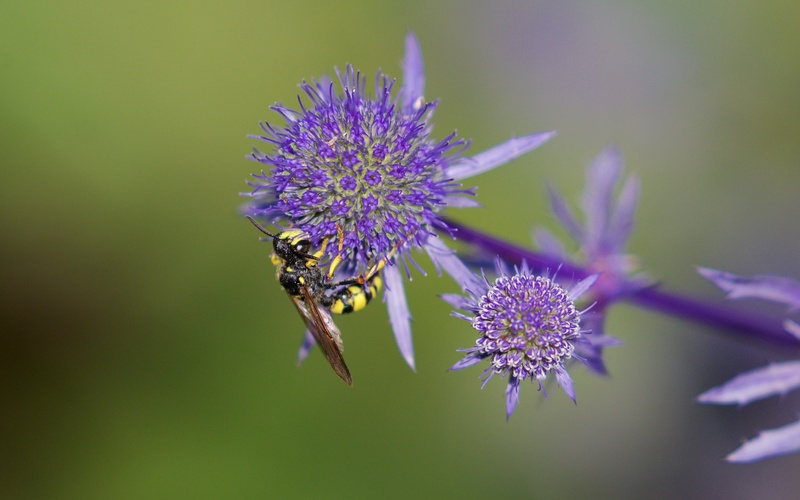 The flowers are worked by an array of unknown species of hoverfly (Syrphidae) and bees and wasps (Hymenoptera); lavender (Lavandula angustifolia) and blue thistle flowers (Eryngium planum) are constantly adorned. High Elms is an important refuge within the rolling suburbs for people, wildlife and golf balls. I think a nomad bee species on blue thistle. The small downland reserve known as White Hill, up a path from Shoreham station is quiet with just a group of butterfly watchers bent over the plants. The rides are wide and protected from the wind by thick banks of yew, juniper (Juniperus communis), whitebeam (Sorbus aria), dogwood (Cornus sanguinea), buckthorn (Rhamnus cathartica) and other shrubs. Dense cover returned quickly after the abandonment of grazing and now has to be pushed back by regular winter clearing; the chalk flora in the protected and intimate avenues is diverse and pretty as are the myriad butterflies. 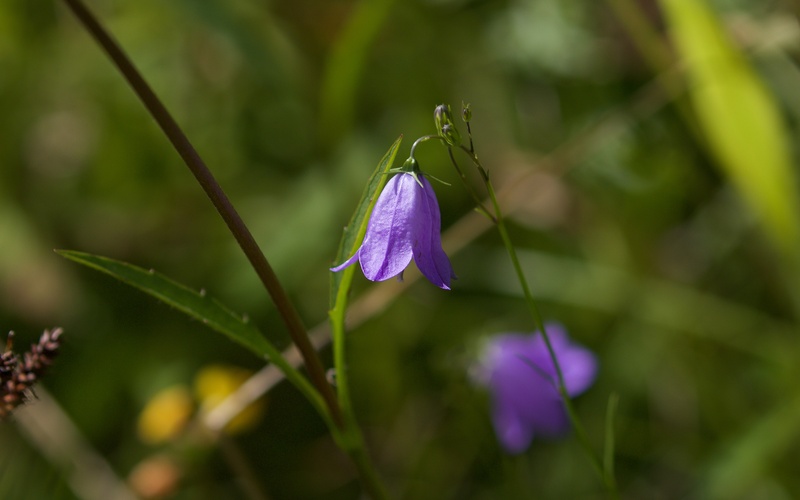 The plants of the clearings are pastel blues, pinks and purples with a smattering of stark yellows and whites. 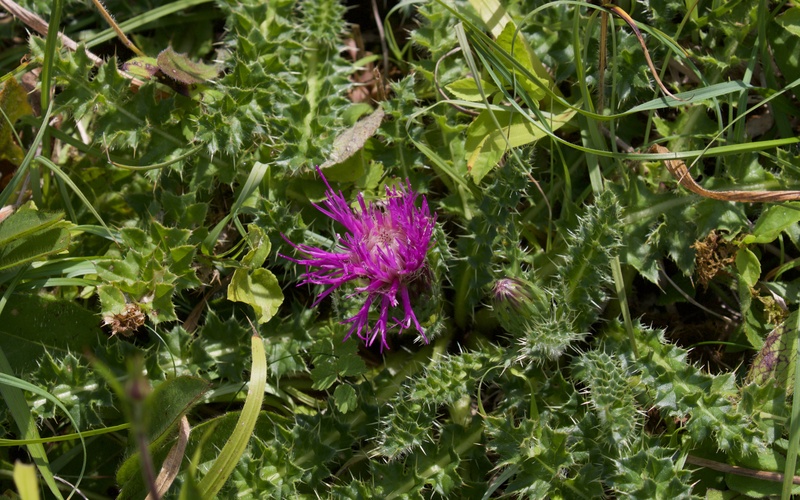 They include: common centuary (Centaurium erythraea), field scabious (Knautia arvensis), greater knapweed (Centaurea scabiosa), harebell (Campanula rotundifolia), hedge bedstraw (Galium album), marjoram (Origanum majorana), milkwort (Polygala calcarea), mouse-ear hawkweed (Hieracium pilosella), squinancywort (Asperula cynanchica), stemless thistle (Cirsium acaule), wild basil (Clinopodium vulgare), yellow-wort (Blackstonia perfoliata) and quaking grass (Briza media). Eyebright (Euphrasia sp.) and wild thyme (Thymus polytrichus) are largely confined to fine-soiled anthills. The chalkhill blues (Polyommatus coridon) are out and keep low, looking almost white against the sward; the marjoram seems the preferred nectar source; there is little though of the larval food plant, horseshoe vetch (Hippocrepis comosa). The caterpillars are also protected by ant species which offer them some protection from predators and parasitoid wasps in exchange for sugary secretions from a special gland. The vetch, the ants and thus the blue require hard-grazed (or mown) chalk grassland and hence only exist together in isolated patches of managed nature reserves within dead seas of arable land as well as unsuitable scrub and woodland. The butterfly is, like many other species with specialised habitat requirements, ‘conservation dependent’; a status greatly assisted by its pale beauty. 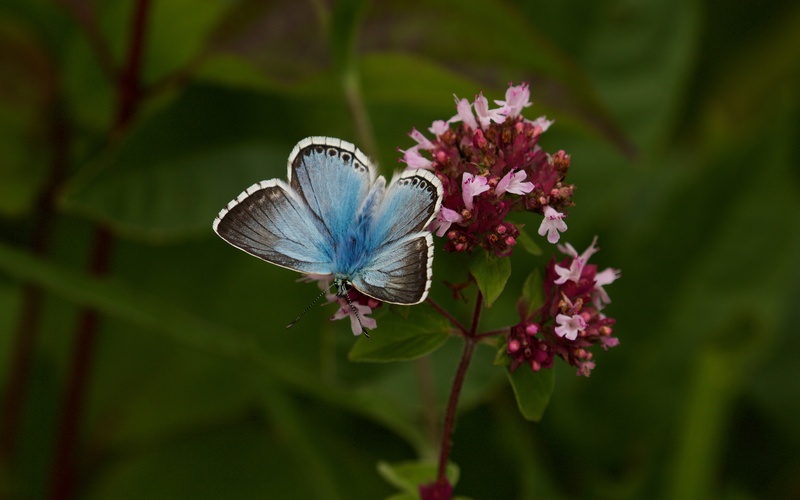 Male chalkhill blue on marjoram. Coincidentally and unsurprisingly, the chalkhill blue was nominated as the “Insect of the Year” in 2015 for Germany, Austria and Switzerland. A recent review states that ‘genetic patterns strongly support the existence of ice age refugia in Italy and in the Balkan Peninsula at least during the last glacial period.’ Other such refuges are also found in the Pyrenees and Iberian Peninsula. The species expanded its range as the climate ameliorated and presumably as pastoral agriculture spread north especially along the great river valleys. Analysis of genetic lineages provide road maps of the route marches across Europe and Asia along sinuous corridors over thousands of years. Today, the scattered pockets of population of this remarkably resilient butterfly, like so many other species on the edge of their range in Northern Europe, are perhaps no more than beleaguered outposts; abandoned Roman legions still fighting to hold the hills in a landscape long lost to Vandals and Visigoths. Recent evidence suggests not; the English population has expanded since the 1980s in response to conservation management and warming summers. 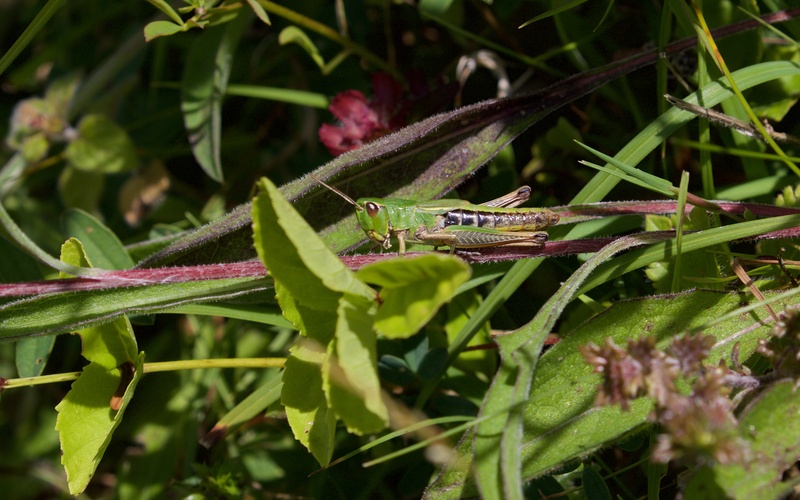 The remnant populations on the tops of a few chalk hills are proving to be modern refugia. The only niggling question is how are the ancient core populations in Southern and Eastern Europe faring since they do not receive very much conservation attention at all? If the extensive karst landscapes of Montenegro are anything to go by, the species is likely to be thriving in parts. Common blue (Polyommatus icarus), brown argus (Aricia agestis) and a fleeting holly blue (Celastrina argiolus) buzzing the ivy (Hedera helix) hedges are also here. A silver-washed fritillary gallops through and brimstones (Gonepteryx rhamni), skipper species (Hesperiidae) and six-spot burnet moths (Zygaena filipendulae) alongside ubiquitous meadow browns (Maniola jurtina) and gatekeepers make a rich community in this unassuming nature reserve of subtle colours. 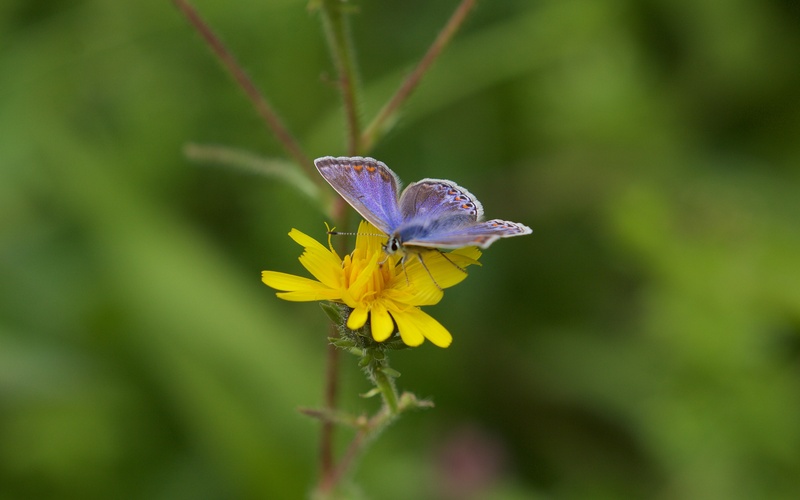 Common blue female on mouse-ear hawkweed. 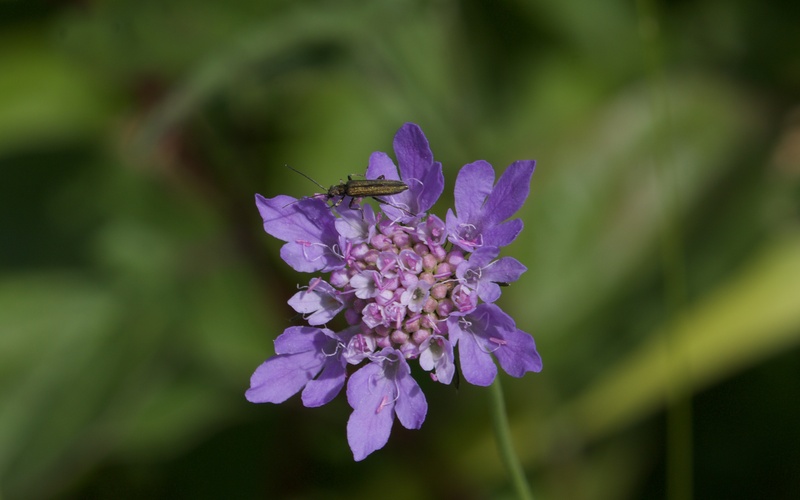 Green beetle species on field scabious. Someone was waxing lyrical in the first para! Great writing, very inviting. I also loved the idea of the Italian statue sneaking off, perhaps she’s gone for a quiet cigarette to escape the kids. Fantastic shots of your butterflies – were they obliging, or was there a lot of gentle cursing going on as they flitted about. Keep them coming, they provide a wonderful breath of fresh air in a very hot and muggy NC! Thanks. I have to admit that the butterflies are, with a few exceptions, very accommodating. Don’t broadcast that though. I seem to remember our paths crossed on Merlin in the 80’s/ 90’s in Wales ? I worked with that roughest of rough diamonds Hermann Ostroznik Sr & Paul Toyne on Gos for many years, then with Steve R on Honey B etc etc. Like your style of writing. I spend all my time flying Gyr & Gos now enjoying having nothing else to do but watch the Hobby fly by. Hi Mike, Many thanks for the kind words and for reminding me of some good days on the Welsh hills. I spent a hot July day walking the fencelines with Hermann looking for merlins on Mynydd Eppynt. We never found a thing. I think he preferred being in the forest looking for his beloved sparrowhawks and goshawks.